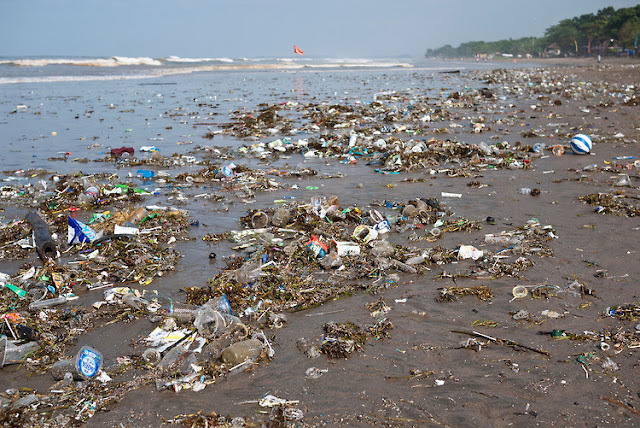 Bali's palm-fringed Kuta beach has long been a favourite with tourists seeking sun and surf, but nowadays its golden shoreline is disappearing under a mountain of garbage. "When I want to swim, it is not really nice. I see a lot of garbage here every day, every time," Austrian traveller Vanessa Moonshine explains. "It's always coming from the ocean. It's really horrible," she adds. The archipelago of more than 17,000 islands is the world's second-biggest contributor to marine debris after China, and a colossal 1.29 million metric tons is estimated to be produced annually by Indonesia. A 10-kilometre radius of the volcano's crater. "Garbage is aesthetically disturbing to tourists, but the plastic waste issue is way more serious," he told AFP. The Bali government should spare more budget to raise people's awareness to take care of local rivers, not to dump waste," he said. "The central government should boost the campaign to reduce the use of plastic packaging and ban free plastic bags at convenience stores." every vacation we have ever had wether in the Carabean or Mexico, or Equador or the Bahamas garbage is every where, they dont clean it up , if they are done drinking a water bottle they throw it to the ground or likewise a bag a paper a bottle all to the ground and its a big big turn off, so i dont go anymore to those places. Why don't they just throw the trash into the volcano. Problem solved. Totally understood, it would be so discouraging to see indigenous people trash their own land. It makes one wonder what type of social conditioning they've been subjected to, that would cause them to disrespect their own environment to that degree. I'm sure that hasn't always been the mindset, otherwise, it would never have been considered a pristine paradise to begin with. Definition of Paradise: An island not bought up by the Travel industry Cartel. That's bankers, insurance, equity, and travel/tourist companies. I was raised by a mother in the 50's who was before her time. she would take a wrapper home to throw into the trash. She taught us to clean up after ourselves, throw away trash in proper places, not to litter and if unable to throw it in a proper place, put into a bag to throw away later, she also taught us to recycle anything and everything possible. food, buttons, clothing, she was a wise woman. A disposable, corporate culture inundates other cultures with garbage ... and you blame the indigenous. How is such a small percentage of the world responsible for this massive amount of garbage. One finger points out, three point back. The whole world is to blame (the polluting people's worldwide who throw a bottle, wrapper or what have you a few at a time) for the mess on the beaches and the oceans, it washes up on the beaches from the oceans and it is just the tip of the iceberg compared to what has not been washed up and is sitting at the bottom of the oceans. I blame all of the ignorant, badly raised populace who haven't been taught not to litter or pollute, It starts at home just like also teaching manners and hard work, if children do not learn these things from their parents, they will not learn at school or in the evil world around them.